It’s a rainy day that would have been perfect for watching the lads race over a few hills in the Tour de France. However, what with one thing and another, I’ve been out most of the day and missed them. Thank homo sapiens for ITV4’s highlights programme this evening. Butterflies have been featuring in my life recently. This is not unusual as, when driving the roads of rural France, I am prone to slamming on the anchors, leaping from the car and chasing an unrecognized butterfly across a field or two in an attempt to identify it. I love them; killing them for the purposes of identification is unthinkable. France has a few more exotic species than we do but some do make it across the English Channel. One such is the Painted Lady butterfly which is apparently here in larger numbers than usual this year. Given our weather since Wimbledon fortnight, were I a Painted Lady, I’d lift up my skirts and high-tail it back to France, it has to be said. 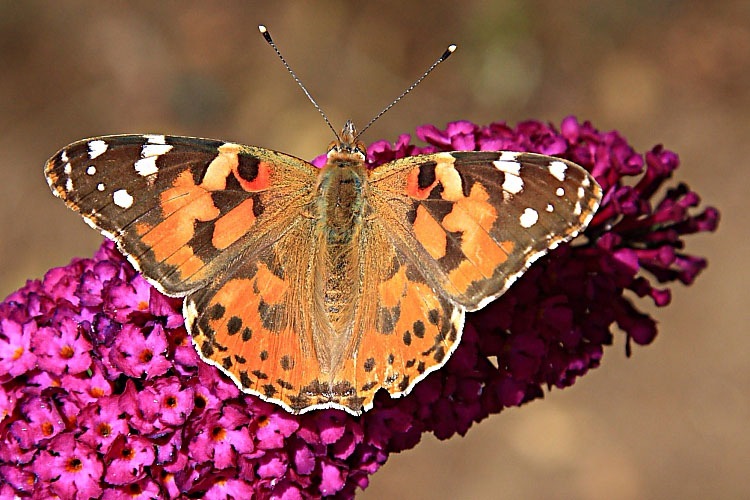 Be that as it may, our buddleia was visited by a Painted Lady just yesterday and, though it wasn’t a perfect specimen (it had a slightly ragged hindwing), because I am not used to seeing them at home, I snapped it. 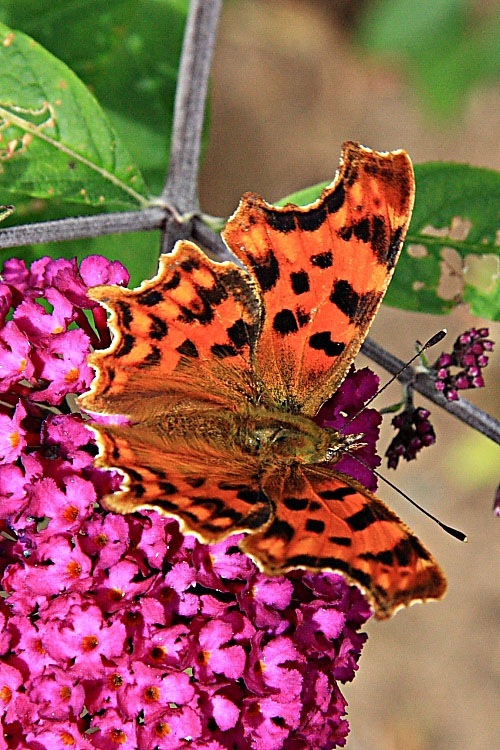 At the same time, our buddleia played lunch to a Comma butterfly, which is also less than usual, so I snapped that, too, though less successfully (not the best angle). Some butterflies are relatively easy to photograph because, when they settle, they do so with their wings open so their markings are readily visible and snappable. The Painted Lady and Comma fall into that category. 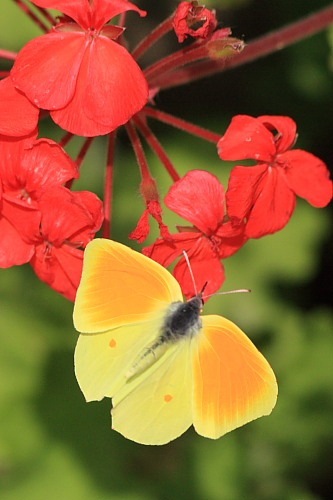 There are other butterflies that habitually sit with their wings tightly folded shut. 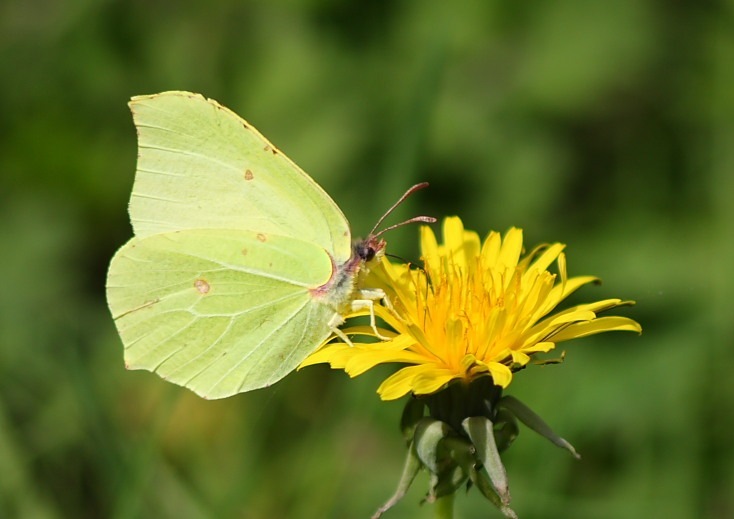 Our delightful yellow Brimstone butterfly is one of these less cooperative photographic subjects and the usual readily grabbed picture is of the underside of the wings as shown on the right. During our trip to Corf in May, we were surrounded by masses of Cleopatra butterflies whilst hiking the Corfu trail. 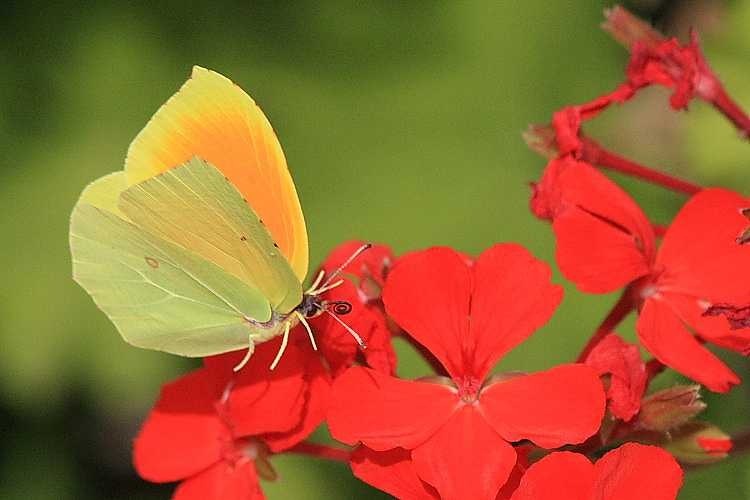 Cleopatras resemble Brimstones in that they are essentially yellow (the males, at least) and, when settled, they sit with their wings firmly shut. This is irritating because the upper surface of their forewings has a striking orange blush. A picture without the blush would be pointless but that meant snapping them in flight. I thought I’d use my day of rest from walking to try. Armed with my camera and trusty 300mm lens, I dialled the ASA rating up to 800 to get as fast a shutter speed as possible, about 1/2000th, before zooming in on several settled Cleopatras and waiting for them to take to the wing. It quickly became apparent that automatic focus was not going to work. Butterflies are simply much quicker than the reaction time of the lens. I have to confess that my reaction time was also somewhat lacking trying to follow them. I switched to manual focus, focussed on the settled critters and waited for them to take to the wing again. The trouble with this approach is that they fly UP, out of my narrow plane of focus, and are fuzzy. Finally, I tried focussing on the settled Cleopatras and then backing focus off a tad so that, when they flew, they flew up into the plane of focus. I was still personally slow and missed several but I finally managed to catch a few shots when luck and timing were running in my favour. Both shots are in flight, honest. 😉 One shot shows the Cleopatra’s colours well but I love the shot with the wings partially closed showing the curled proboscis and shadow of the legs on the plant. From about 70 attempts, I kept four. Thankfully it wasn’t film; I was only wasting reusable pixels.